BU PG Admission Entrance Test Admit Card 2015; The University of Burdwan holds an Entrance Examination for admission to Post Graduate Regular courses. Burdwan University will hold an Entrance test on the below mentioned dates for entrance test of candidates who fall under 40% category. After the Entrance Test/Admission Test a merit list of 40% category will be prepared on the basis of performance done by the candidate. 60% Seat of Total intake will be reserved for Burdwan University Students. If a Home University Student could not get a chance in 60% Merit List, He/She can get His/Her name enlisted in the 40% category list upon performance of Entrance Test. Other Than Burdwan University Students must appear in the Entrance Test to get a position in the merit list. 18-August-2015 (12:30 PM): English, Economics, History, Political Science, Sociology, Santali, Urdu & M. P. Ed. 18-August-2015 (03:00 PM): Mass Communication. ** Date and venue of Personal Interview (Mass Communication): 21.08.2015 at 11.00 a.m. in the department of Mass Communication, Golapbag, B.U. 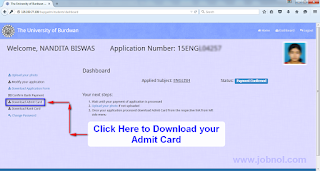 How To Download BU PG Entrance Test Admit Card ? 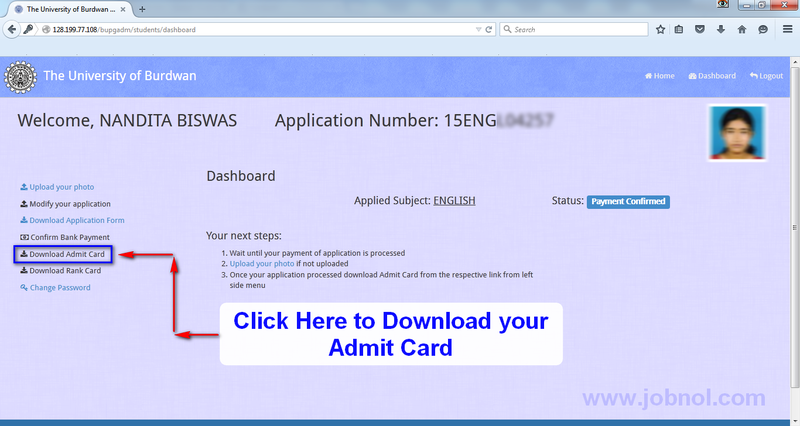 Open Admission Portal : Link > Go to "Login to Student Profile" (Link) > Login to your Application Dashboard using your Application registration No and Password > See Left Menus and Click on "Download Admit Card" > Click Download Admit Card, to get your Admit Card for Entrance Test. (See Image Below). *** Admit Card will be Available 72hours Before Commencement of Examination. We will update our page if we have any news regarding BU PG Entrance Test Admit Card. Please check back to this page regularly. Thanks..! 0 Comment to " BU PG Entrance Test Admit Card 2015 Download for Admission to Regular - buruniv.ac.in "